The head of an animal rescue group says experts are on Miscou Island today to examine the latest North Atlantic right whale to be found dead in the Gulf of St. Lawrence. Tonya Wimmer of the Marine Animal Response Society said the carcass was towed to Miscou, in northeastern New Brunswick, for the necropsy. 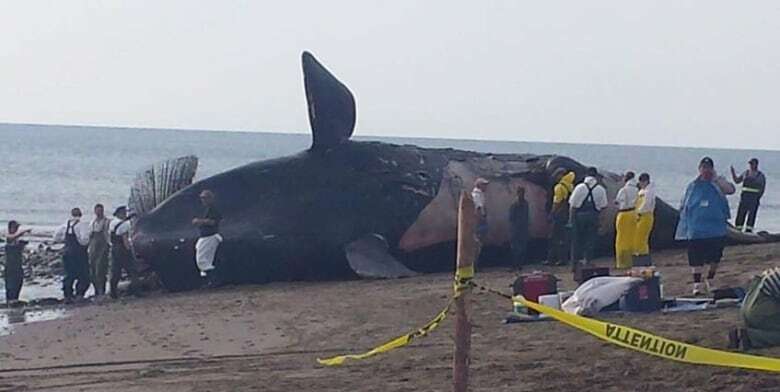 The whale was the eighth to be found dead in the gulf since June. Wimmer said her group, along with the Department of Fisheries and Oceans and colleagues with the Canadian Wildlife Health Cooperative, will try to determine what killed the whale. Previous necropsies revealed some whales suffered blunt trauma and bore signs of chronic entanglement. Collisions with vessels have been suspected as the cause of the trauma. North Atlantic right whales are critically endangered, with just over 500 estimated still alive. An aerial survey by the National Oceanic and Atmospheric Administration in the U.S. spotted the latest dead whale on Wednesday afternoon east of Shippagan. Wimmer said the survey also revealed another entangled right whale in the Gulf of St. Lawrence, but Department of Fisheries and Oceans has backed away from rescue attempts since the death of whale rescuer Joe Howlett last week. Howlett, who co-founded the Campobello Whale Rescue Team, had just freed a whale tangled up in fishing ropes when the mammal killed him. The whale rescue was performed from a Department of Fisheries vessel based in Shippagan. On Thursday, the department said it was closing the snow crab fishery in Area 12 off northern New Brunswick early in response to the latest whale death. The harvest was already 98 per cent complete, the department said, adding the early closure would still have an impact on fishermen.